The other Probolinggo tourism that we can find is Jabung temple, which becomes one of ancient and historical heritages in Probolinggo. It is located in Jabung village, in Paiton district. 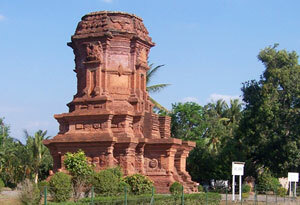 Jabung temple was made by red stone with 13,11 length, 9,58 m, 15,58 m height. There are also some relief panels, which its story is not surely known yet. The relief panels represent daily activities such as: a hermit wearing “surban” stands opposite to his student, Two men who are near well, a lunar shape panel ground like medallion, some lions sit opposite.